Proudly serving delicious Italian dishes with generous portions and family-friendly prices since 1963. Charlie and Fred Osso grew up surrounded by the best of southern Italian cuisine – fields of olive trees, red onions, and tomatoes. 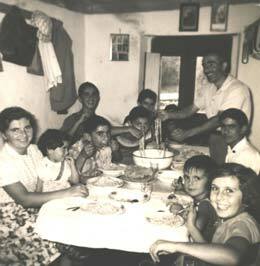 Little did they know, growing up on their family farm in Calabria, Italy, that they would one day own one of northern New Jersey’s most popular Italian restaurants. Charlie and Fred came to America with their father, eager to work and help pave the way for the rest of the family to join them. Charlie began working as a baker at Belmonte Bakery in New York City, while Fred became a chef at Jerry’s Italian Restaurant in Fort Lee. To be closer to his family, Charlie relocated to Rudy’s Pizza in Closter, where he made pizza for original owner Rodolfo “Rudy” Coniglio. When Rudy decided to retire, Charlie and Fred gathered their savings and took over the restaurant. 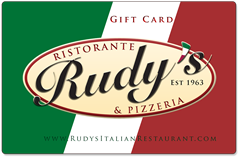 With Charlie making the pizzas and Fred in the kitchen, they catered to Rudy’s loyal client base and worked hard to deliver an authentic Italian dining experience, always present to run the day-to-day operations and perfect the dishes. With a commitment to quality ingredients and family-friendly prices, they had great success, introducing traditional Italian pasta, seafood and specialties to the menu. As the business continued to grow through the years, they expanded the dining room and added a wine list and bar. It was always a family affair at Rudy’s: Charlie’s wife Nina was a waitress and hostess, and all four of Charlie and Fred’s sons grew up working behind the pizza counter. While Charlie, Fred, and Fred’s sons Anthony and David celebrate nearly five decades in Closter, Charlie’s son Rick has extended the brand, creating Rudy’s of Garwood. Together with the Garwood team, Rick is bringing the same great Italian dining experience he grew up with to central New Jersey. Both locations offer delicious Italian meals at great prices, as well as take-out, catering for parties on site or off, daily specials, premium cocktails, and a full wine list.